UPDATE: 2:30 PST A spokesperson for the U.S. Department of Homeland Security released a statement that reveals there is no evidence of a terrorist plot against U.S. movie theaters that are screening The Interview. This statement comes in response to the hacker group G.O.P. 's ominous message that moviegoers should "keep yourself distant" from movie theaters playing The Interview, which arrives in theaters on Christmas Day. Take a look at the brief statement from the Department of Homeland Security below. "We are still analyzing the credibility of these statements, but at this time there is no credible intelligence to indicate an active plot against movie theaters within the United States." Original Story: The hacker group known as the Guardians of Peace (G.O.P. ), which infiltrated Sony Pictures and leaked thousands of documents, emails and films themselves, have now threatened to attack any movie theater showing The Interview, which opens in wide release on Christmas Day. The film stars Seth Rogen and James Franco as a TV producer and host who travel to North Korea to interview Kim Jong-Un (Randall Park). Before they leave, the duo are recruited by the CIA to assassinate the dictator. Ever since the security breach first happened in November, many have thought that the North Korean government is responsible for the massive hack, in retaliation for the movie's release, since Kim Jong-Un himself denounced the movie back in June. North Korean U.N. ambassador Ja Song Nam also declared the movie an "act of war" in July. While the country has denied any involvement, they have praised the attacks. Take a look at the full message from the G.O.P. below. It's worth noting that The Interview has already held its Los Angeles premiere at the Ace Hotel last week, which went off without incident. However, the film's New York premiere is scheduled for Thursday, December 18, although it isn't known yet if Sony will alter or cancel the premiere in the wake of this warning. The message was also accompanied by another leak of Sony documents, with the promise of a "Christmas gift" of new files relating to Michael Lynton, the CEO of Sony Pictures Entertainment. Past leaks have included documents relating to films' budgets, employee records, salary information for top executives and even Social Security numbers of Sony Pictures employees. 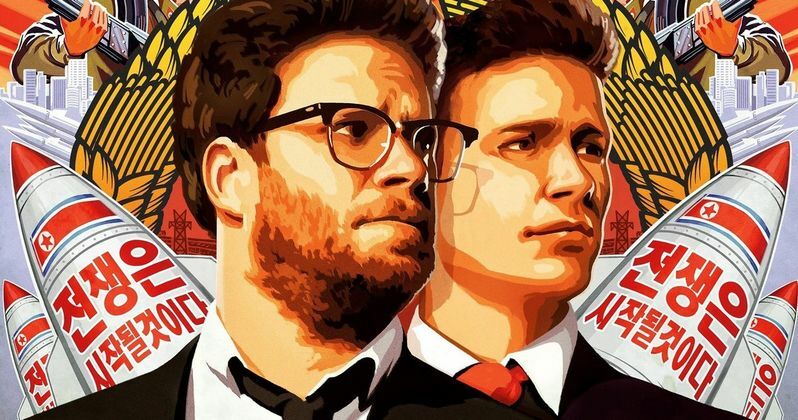 Sony Pictures has yet to comment on the recent message, and, according to Deadline, they have not addressed inquiries into whether or not security will be increased at theaters showing The Interview.